You must create an event before you can send an invitation. If you have not created an event yet, please review this tutorial first: Creating and Managing Events. Once you have created your event, the following tutorial covers how to create and send your invitations. Send your invitation to as many recipients as you like and they will automatically be added to your invitation list. 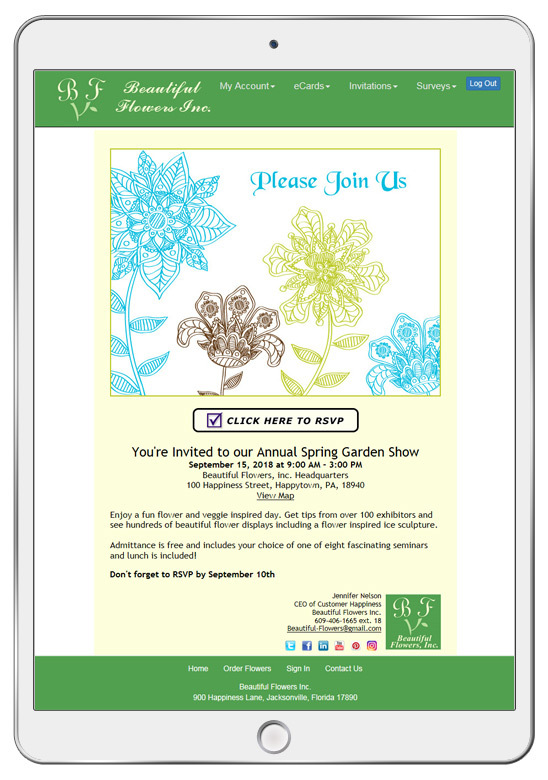 Your recipients can click on the RSVP link within the eCard to respond to your invitation. We recommend creating an invitation and sending it to yourself first, so you can see your recipient's experience and then adjust as needed. When you're happy with your invitation, go to your 'Sent eCards' bin. Find your invitation and from the options drop down menu, select 'Copy Card.' This will create an exact duplicate of the invitation without affecting the original. Make any adjustments you wish and then address and send your invitation.